Power factor is an indicator of the health or efficiency of your power distribution system. Certainly this entire publication could be devoted to power factor, but we will attempt to briefly highlight the key elements, how it impacts your operation and utility cost and offer some general solutions. Power factor has been defined in several ways. 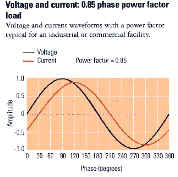 It can be said that power factor is the ratio of working (active) power (watts or kilowatts - kW) to apparent power (volt ampere or kilovolt amperes - KVA); or it is also defined as the ratio of the current drawn that produces real work to the total current drawn from the source or supplier of the energy, such as the elec tric utility. In any AC system there are usually four types of power: real power, reactive power, harmonic power and apparent power (or total power, composite of the first three). This is the electric power that performs the useful work. It is what turns on the lights, causes motors to rotate or produces heat in a resistive element. Real power occurs when the current and voltage are sinusoidally varying in phase, peaking and crossing zero at the same time. Real power is measured in watts or kilowatts and billed by the kilowatt-hour. Reactive power is stored and released by inductance and capacitance elements in a power system. Reactive power is very important to the proper functioning of electrical equipment. For example, the magnetic fields necessary for motors with stator or rotor windings could not function without reactive power. With reactive power, the voltage and current are 90 electrical degrees out of phase. This is the result of voltage and current at frequencies above or below the fundamental frequency at which normal AC power is delivered; usually referred to as harmonic distortion. These effects are the results of equipment such as computers, electronic ballasts and ASDs. 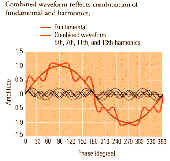 When harmonics are present, the power from the harmonics are usually added to the 60 Hz vector sum to compute apparent power. This only examines the 60 Hz fundamental frequency and measures the degree to which the voltage and current are out of phase. This is the value typically recorded and tracked on most utility bills. It is the ratio of the actual or real power being used to the apparent power. Many utilities have riders or rates established to reward or penalize customers with power factors above of below certain values. Recall that although reactive currents may not do any work they still impact system capacity and loads since flowing current incurs I2 R losses. Distortion power factor takes into account the fact that electrical power has a shape component; so waveform distortions such as harmonics and other noise also dissipate energy against any resistance. 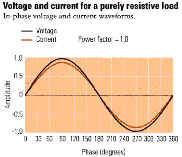 Harmonics and noise are generally out of phase with the fundamental frequency current so can further degrade power factor. Total Power Factor or True Power Factor includes both of these components. Many utilities do not measure total power factor but are looking for metering devices to begin tracking total power factor information and including it in the billing mechanism.